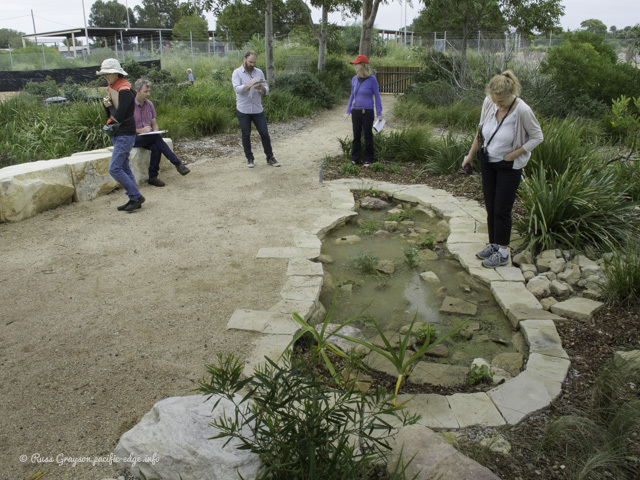 THEY KNEW they were in for tough competition from big projects like Adelaide Botanic Gardens Wetland and Wynyard Walk, but when they were awarded the ’highly commended’ at the 2017 Sustainability Awards, that came as something of a surprise. 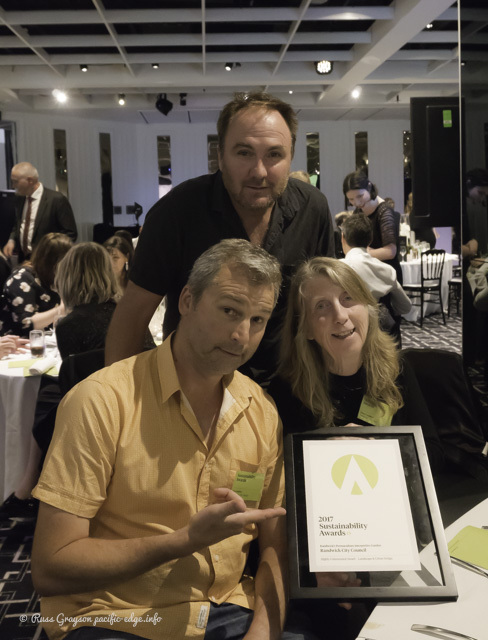 The crew with their award…Landscape architect/permaculture educator Steve Batley (left); architect Terry Bail (rear); local government sustainability educator, Fiona Campbell (right). “We really didn’t expect it”, said landscape architect and permaculture educator, Steve Batley. 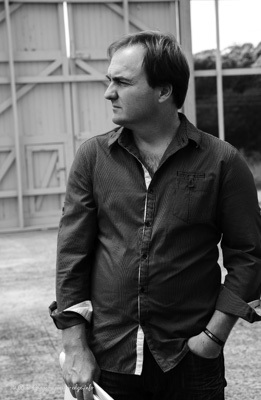 “We were up against these big, high-budget projects and ours was so small in comparison. “What it does show, though, is that thoughtful design rather than size counts for a lot, and that the permaculture design system is now recognised as a valid methodology among the design professions”. That recognition has been developing for some time. 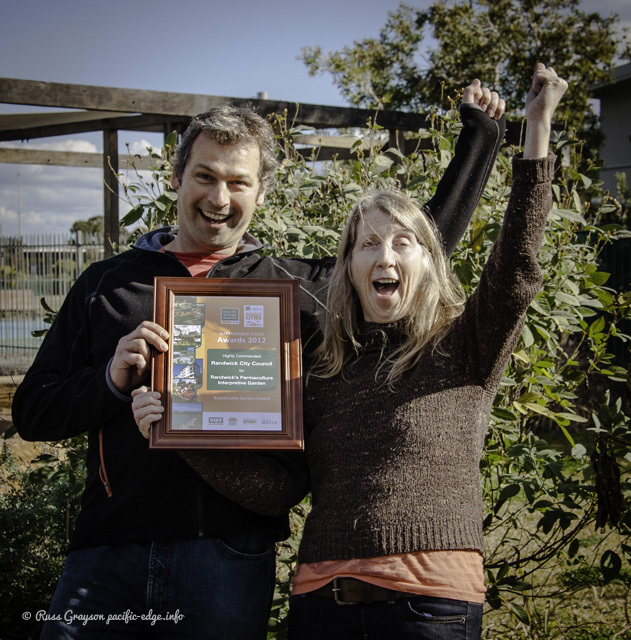 Steve designed the Permaculture Interpretive Garden (PIG) that won the highly commended. Located at Randwick Community Centre and serving as a public park as well as a venue for practical training in the Organic Gardening and Forest Gardening courses offered by Randwick Council’s sustainability unit, the award recognised the integration of components such as kitchen garden, aquaponic/vertical garden array, forest garden, the public reedbed toilet that biomimics the natural wetland to purify wastewater, the propagation shed that uses recycled hardwood in its construction and the wild food and habitat trails presently in development. The garden forms part of the regional park that includes the Randwick Environment Park with its remnant bush and ephemeral lake, the public commons and the Randwick Community Centre. The Habitat Trail will be used in the sustainability unit’s basic science for pre-and-primary schools program. Plantings to attract small birds and for foraging by honey and native bees housed in nearby hives are being made. The habitat trail will be used in the sustainability unit’s basic science for pre-and-primary schools program. The propagation and garden shed was designed by permaculture-trained architect, Terry Bail, who designed the energy and water efficiency retrofit of the community centre building and the adjacent classroom-on-the-commons. Terry attended the Sustainability Awards event. The PIG, as it is called, is also used by the weekly Permabees which council sustainability educator, Fiona Campbell, started as part of the community centre’s social permaculture program to offer social interaction and garden skills to local people. The Permabee is led by permaculture designer and horticultural educator, Emma Daniell, and horticultural scientist, Jon Kingston. 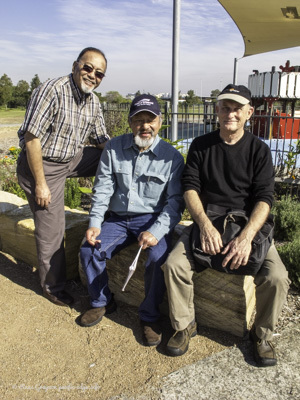 Recently, Australian Conservation Volunteers has started using the garden for its Green Gym seniors’ program which aims to improve personal health and social contact. The site… was seen as an opportunity to prototype the application of permaculture principles and ideas in a local government setting. The classroom on the commons seen from the Habitat Trail. Steve says that despite being accepted by councils and now being more widely applied, the permaculture design systems still has far to travel along the road of professional adoption. “It’s a bit like applying the permaculture principle of ‘small and slow solutions’”, he said. 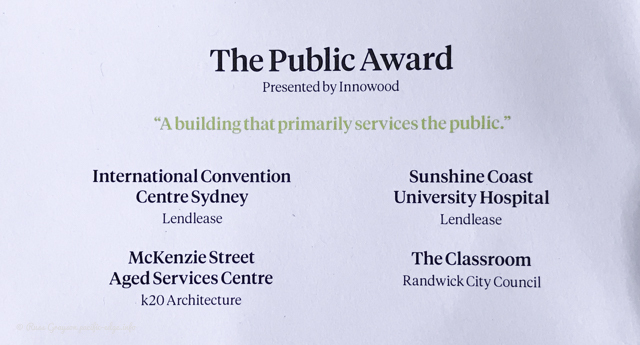 “It’s the accumulation of smaller projects that comply with the local government regulation, Australian Standards and the Building Code of Australia, and that apply professional design standards to achieve something of public value”. The 2017 award was not the first the Permaculture Interpretive Garden and community centre development has received. The centre received a Blue Star Sustainability Award several years ago and a Sustainable Cities award (photo) in 2012. Horticultural scientist and educator, Jon Kingston. 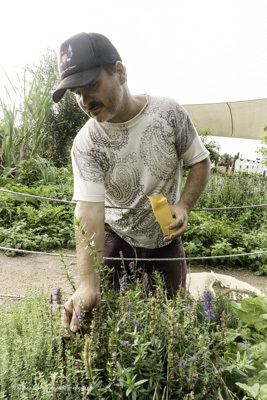 Jon is one of the people who maintain and develop the Permaculture Interpretive Garden. He assists teaching the Organic Gardening course and looks after seed saving to propagate and distribute non-hybrid seed of useful plants. When the site was handed over to council by the Department of Defence, it was seen as an opportunity to prototype the application of permaculture principles and ideas in a local government setting. Over the years, what was a poorly-used, bland expanse of low-grade lawn has been turned into a landscape offering a range of active and passive recreation and learning opportunities, as well as significantly improving the area’s habitat value to wildlife. The project was developed as funding became available. construction of a new community centre entry with pergola, seating and landscaping for shade and habitat. The Organic Gardening course training garden features raised, self-watering or ‘wicking’ beds made of plastic water tanks and reused hardwood as well as a circular ‘mandala’ garden and a couple other raised garden beds. Were the educational program to end, the landscaping presently used for food species could be repurposed as habitat plantings for the provision of environmental services. a basic science program for pre-and-primary schools that includes water, solar energy, seeds, food and habitat components. Guided tours are part of the educational program based in the Permaculture Interpretive Garden. annual events including International Permaculture Day, Fair Food Week, a community goods swap during National Recycling Week, film evenings, the Eco Living Fair and Earth Hour Twilight Picnic. Permaculture-trained people holding a Permaculture Design Certificate as well as professional qualifications are employed part-time or as consultants for the education and social programs. Permabees are managed by horticultural educator and landscape designer, Emma Daniell, as well as horticultural scientist, Jon Kingston. Emma Daniell provides horticultural education and garden management in the Permaculture Interpretive Garden. 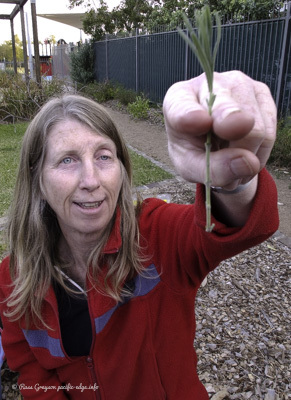 She is a qualified landscape designer, horticulturist and permaculture designer. Annette Loudon from Community Exchange Systems runs community swaps and teaches collaborative economics in courses. Collaborative economics and new economy in the courses are taught by Annette Loudon of Community Exchange Systems Australia. 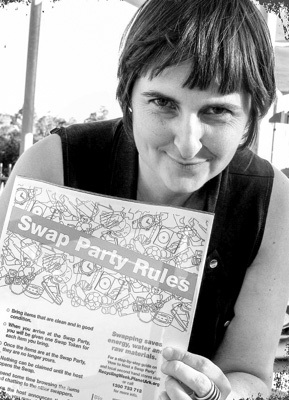 Annette also organises the community swap parties where people exchange goods rather than discard them to landfill. 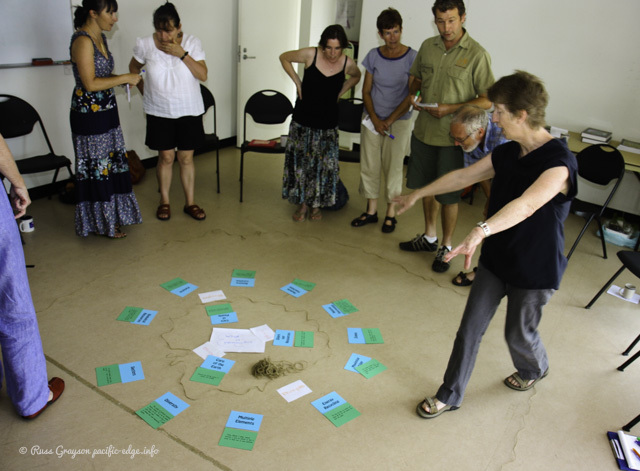 Domestic management educator, Cecilia McCauley, teaches declutteering homes and lives using permaculture principles. Past staff include the Inner West Seedsavers’ and the Australian City Farms and Community Gardens Network’s Jane Mowbray, and ex-chef and teacher, Leesa Marie. Documentation of the project is done by the author of this article. With so many permaculture-qualified designers and educators, it is no surprise that a number of permaculture design principles operate at the community centre. The principle of using permaculture as a platform of ethics, principles and characteristics for the development of useful applications such as community/food/schools education, as well as building nature habitat, providing recreation opportunity and applying social permaculture such as community economics, social interaction and participation was adopted. 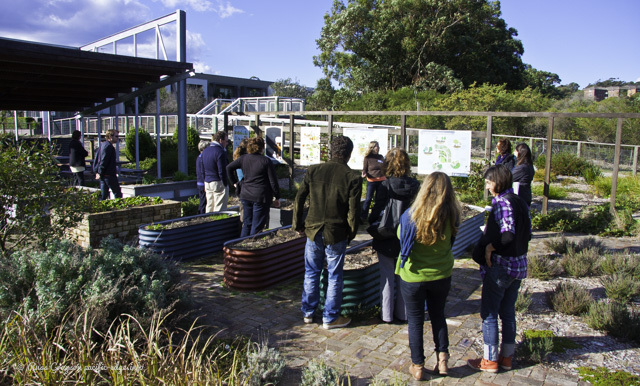 As a prototype permaculture project within a civic or local government context, the centre was envisioned as a community resilience education hub as well as a public land commons/regional park (a regional park attracts people from beyond the local area) that complements other hubs and organisations in the coastal, urban east. An approach that regards systems as interconnected and interacting sets of elements coherently organised to achieve some goal was adopted. It took form in the relationship between the different components of the landscape and buildings and the relationship of the educational and social elements of the design. Any physical entity is surrounded by and exchanges material and energy with its environment. Recognising this, to prevent pollution, wastes on site are recycled; habitat has been planted to increase opportunity for wildlife; and landscaping was designed to provide a range of opportunities for birds, insects, reptiles, amphibians and humans. A general plan for the development of the site was adopted with users of the site, local sustainability groups, staff and community participation. This set direction, a vector of travel to develop the site. It did not lock development into a fixed timeline with a project schedule or a rigid strategic plan. The implementation of works along the vector were not planned in detail so as to allow adaptation to changing conditions and to take advantage of opportunities that arise. This enables the project to remain agile. The network effect states that the value of a network is proportional to the number of active users. To implement this, a diversity of courses and opportunities, as well as the landscaping of the community centre, were introduced to improved its value to a greater diversity of users, some of whom make multiple uses of the centre and its services. They form a network of users connected by attendance at events and courses and by a regular enews. Some assist in running events. The site serves as regional city park for active and passive recreation, social gatherings, habitat value and community and schools education. Habitat value complements the adjoining 13 hectare remnant of Eastern Suburbs Banksia Scrub, some of the six percent of the ecosystem remaining. Multifunction design was also stimulated by the increasing density of population in the region. Permaculture designers involved in the development believe that social design in permaculture should go beyond skills in facilitation, decision making and group organisation. Those are taken care of in the community leadership course offered at the community centre. The concept of social design was extended to offer a range of facilities and programs that provide for different types and intensity of use. That use is monitored by observation so that facilities can be changed over time. This is part of the ‘agile development’ of the community centre site. The site was developed in three phases according to financial and staff availability. Construction followed the modular development principle of design, construct, tweak, then expand in manageable, staged modules scaled to purpose, skills and funding. 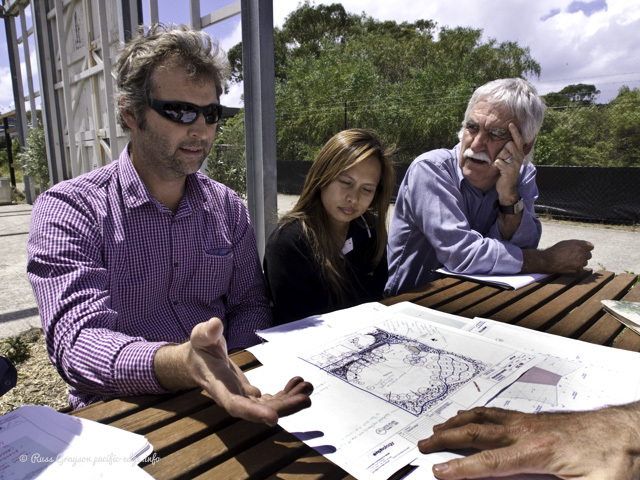 Landscape architect Steve Batley (left) with Randwick Council waste education staff and Grahame Collier, who is probably NSW’s most experienced sustainability educator (right) discuss site development. Small and slow solutions were implemented for the food and native plant gardens, larger and more-rapid solutions for physical infrastructure. Larger and faster solutions catered for emerging community needs and developments in the broader urban area such as increasing population density as well as the temporary availability of funding. User feedback and observation of how people use the site allows adaptation of the community centre and the educational program. The redevelopment of the community centre and its landscaping involved community participation at the start, including participation by local permaculture and transition towns people. The direction for the development of the site came through a community participation placemaking process when the community centre was opened. 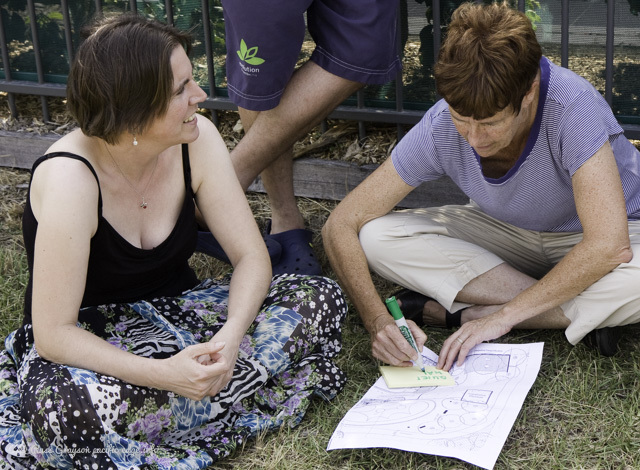 During the participatory planning process for the Permaculture Interpretive Garden, Julie Gaul from the Early Childhood Environmental Education Network and a local Randwick resident works with another Randwick local from a community transition town organisation. The yield of social return on investment comes through the educational programs and public use of the park. The energy return on energy and financial investment comes through offsetting energy use at the community centre by selling excess electrical energy from the photovoltaic array and wind turbine to the grid. 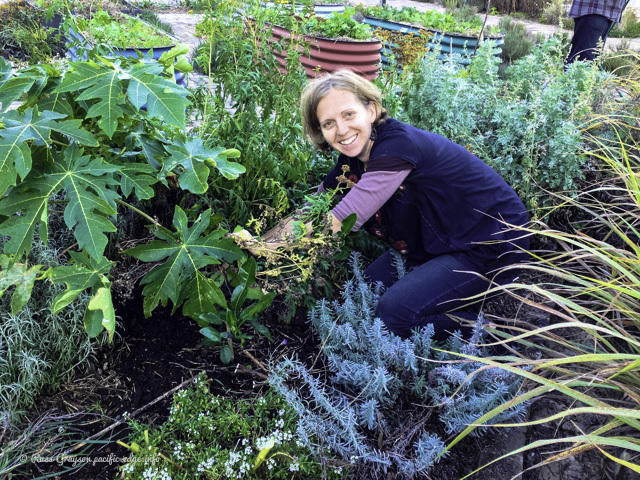 Local government sustainability educator, Fiona Campbell, brought experience as a teacher, landcare educator, permaculture educator and in civil engineering design drafting to the development. those who have made changes in community/home/life and want to share with others on the same journey. Free-of-charge courses and workshops (they are funded through a 2.5 percent levy on rates that is voted in every five years) are offered to increase community skills, knowledge and resilience. These are notified through a monthly news, website (reduceyourfootprint.com) and social media. Where does it count in Sydney’s Eastern Suburbs? First, this is a medium density coastal region where more than half the population live in apartments or attached housing. This population is growing as new apartment buildings are constructed. Food, water, energy and community systems taught in permaculture and installed at the community centre need to demonstrate an appropriate scale. Secondly, there is an ongoing demand for learning resiliency skills. This is evident not only in participation in the courses, workshops and events at the Randwick Community Centre but in workshops offered by the two other local governments in the region. 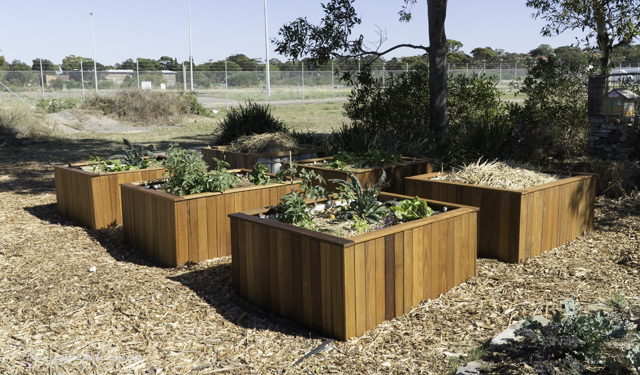 It is also evident in presence of community gardens in the Eastern Suburbs and the active community organisations such as Transition Bondi and Rhubarb Food Coop. These offer an educational avenue towards working where it counts. Renewable energy systems are a core component of the Randwick Community Centre and its educational programs. Energy is harvested with the grid-connected photovoltaic array, solar water heater and wind turbine. Water is harvested from rooftops and stored in water tanks for garden irrigation and toilet flushing, and is supplemented by bore water. The use of used building materials for the classroom-on-the-commons and the propagation shed in the PIG, and the provision of bins for soft plastics, hard plastics and metals and old mobile phones collect materials destined for recycling’s technocycle. 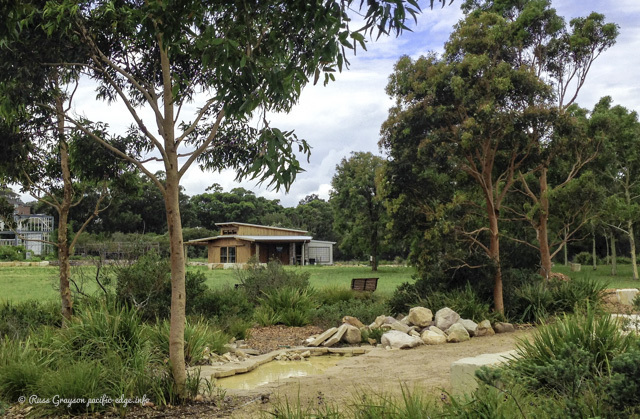 The classroom on the commons, used for the community resilience education courses, in its landscaping that includes Australian edible species. The community centre buildings and wind turbine are seen in the background. Permaculture is about development more than it is about conservation. Permaculture builds and rebuilds things. It modifies buildings and landscapes. The conservation that occurs, whether that is conservation of energy and natural resources, of remnant vegetation or of historical artefacts to provide a sense of use and continuity of an area, is simply part of the permaculture design system’s approach to development. It is integrated into how we, as permaculture designers, do things. It is part of the approach rather than being a prime feature or an add-on. This is the approach taken in the conversion of Randwick Community Centre and its activities from an unimaginative area of patchy, low-grade lawn into a true multi-use regional park. It is this approach that was recognised in the highly commended reward given the PIG at this year’s Sustainability Awards. 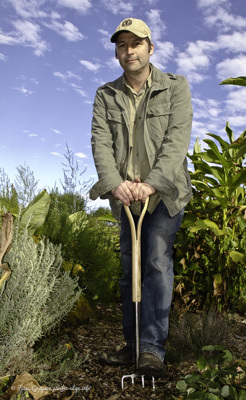 ABC Gardening Australia has filmed in the Permaculture Interpretive Garden. Here program host, Costa Georgiardis, who has MC’d and attended events at the Randwick Community Centre, is seen with Fiona Campbell. 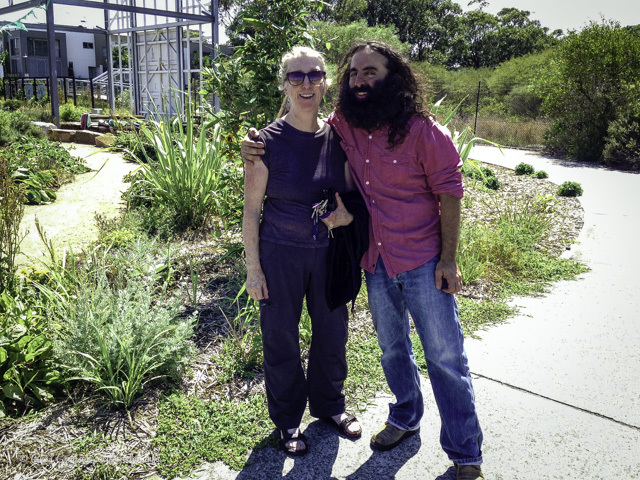 Urban agriculture advisors from Canada (left and centre) on a visit to the Permaculture Interpretive Garden. Landscape architect Steve Batley teaching an Organic Gardening course in the Permaculture Interpretive Garden. 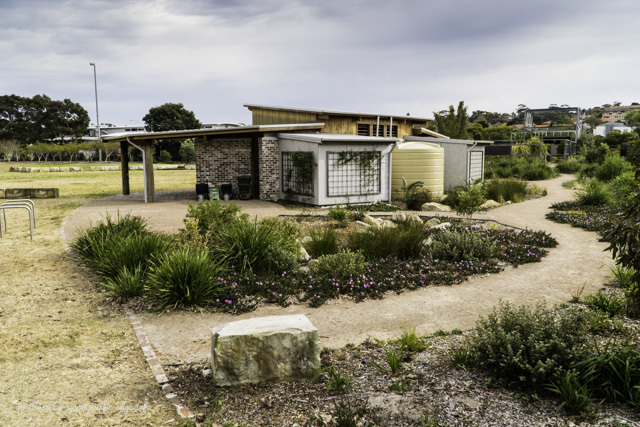 Architect Terry Bail, who also has a Permaculture Design Certificate, designed the retrofit of the community centre building for energy and water efficiency, the classroom on the commons and the shelter and garden shed in the Permaculture Interpretive Garden. Terry specialises in passive and active solar design and the reuse of used building materials. 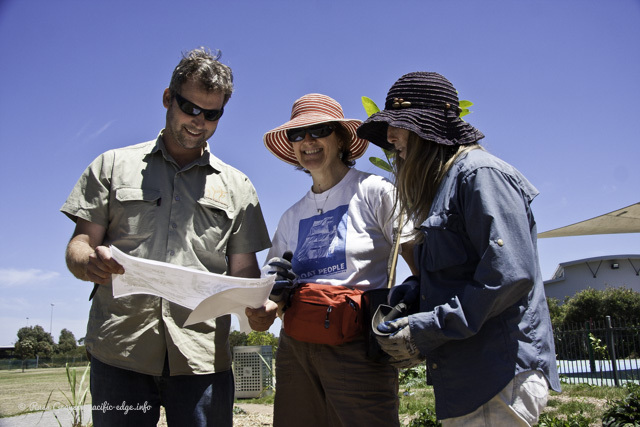 Steve Batley discusses a planting plan with Jane Mowbray (centre) then president of the Australian City Farms & Community Gardens Network and with Inner West Seedsavers, a community organisation specialising in the preservation, through use, of our horticultural biodiversity. Fiona Campbell looks on (right). 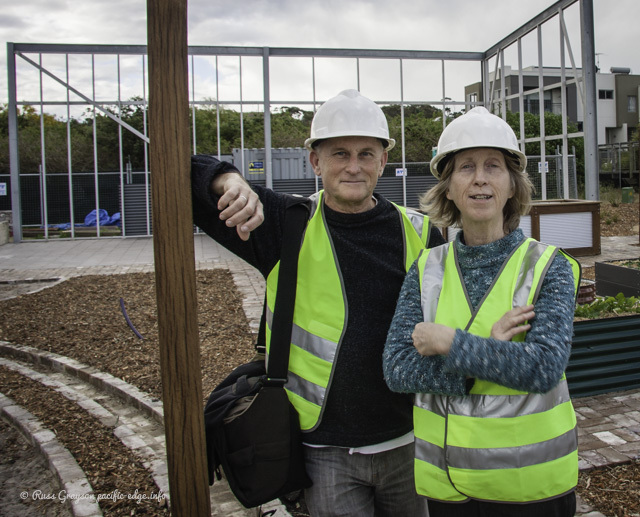 Seen during construction of the Permaculture Interpretive Garden is council sustainability educator and landuse designer, Fiona Campbell, with the site development documenter. Development started in 2008 following a community participation process which, with council, chose the facilities and feartures to be developed on site.